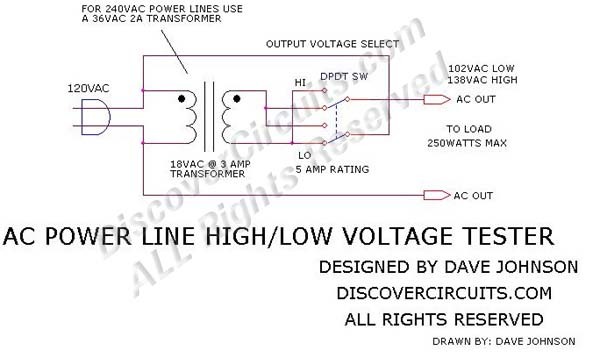 Circuit: #382AC Power Line High/Low Voltage Tester__ Circuits designed by David A. Johnson, P.E. If you wish to test a line-powered device under both a 15% high and a 15% low voltage condition, you can use the circuit below. The circuit uses an 18v transformer with a 3 Amp rating. A double pole, double throw toggle switch then switches in the transformer voltage in either a buck or a boost mode. In the buck mode, the transformer voltage is subtracted from the line voltage. In the boost mode, the transformer voltage is added to the line voltage. With an 18vac transformer the normal 120vac voltage is switched between 102vac and 138vac. For 240vac power line tests, use a 36vac transformer rated at 2A.